Aren't those pretty with their strata of cookie crumbs? The Amazing Turnip Girl made them for her grandfather keeping in mind his tastes the entire time. Dad's a chocolate with more chocolate sort of person, so these were perfect. He also prefers milk chocolate to dark chocolate, so these instructions use that. You can absolutely use dark chocolate. *I've said this before- but good chocolate is one that's only a few ingredients. If you see a bunch of kinds of oils, or see any chemical names other than lecithin- put it down and pick a different chocolate. 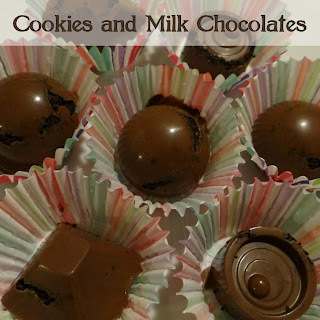 I don't know how those types of chocolate, or chocolate candy will work in my recipes. We used Godiva because it was on sale and I know my Dad likes Godiva chocolate. You can crush the Oreos in a food processor, in a heavy duty zipper type freezer bag or just using a spoon and some muscle in a good mixing bowl. The second 2 methods are fun for kids. Put 2 inches of water in the bottom pan of the double boiler or your improvised version of one, and then set the top or bowl on top of it. Cut chocolate bars into small chunks using a sharp knife. Bring water to a simmer over low heat, and add chocolate and 1 tsp. of coconut oil to the top bowl. Melt chocolate. As it starts to melt, stir it to incorporate unmelted pieces and just keep stirring, it melts pretty quickly. Using the coconut oil makes for shiny chocolates without having to temper the chocolate (which is another skill set and a bit more work with more tools) but the chocolate WILL have to be kept chilled because it hasn't been properly tempered and milk chocolate likes to melt. Get your clean and completely dry mold set on a wax paper lined cookie sheet. This helps keep any accidents off your counter tops! Spoon a small amount of chocolate into each mold, and then a small amount of cookie crumbs using separate spoons, after you've done that in the mold cavities, fill each cavity with more chocolate. Then you just set it in the freezer or fridge to chill until hardened, and unmold the chocolates. The reason I like silicone molds is that you can pop them out from the bottom by pushing up on the bottom of the mold and they come unmolded beautifully. If you want to, you can put them in candy papers or mini-cupcake papers, and chill until you're ready to serve them or give them as a gift. The flavor is wonderful, since they used a good chocolate as a base and the cookies add a nice crunch. Her Grandpa will probably love them since they combine 2 of his favorite things. Chocolate candy and chocolate cookies. You can use different cookies in them if you prefer. Ginger, vanilla, even graham crackers. sounds very nummy! 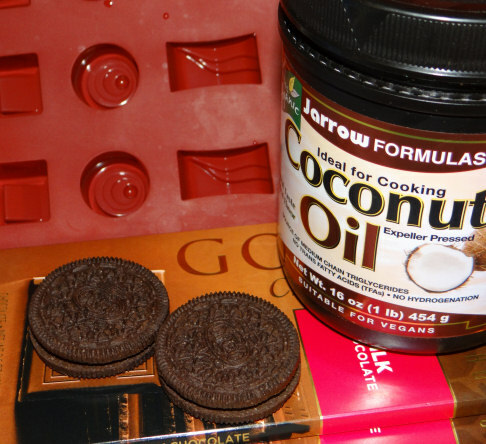 never knew what to do with coconut oil. Coconut oil is pretty multi-purpose! One of the local beekeepers makes a spread of creamed honey and coconut oil. I use it as a base for body butters and also use it in homemade deodorants for TG and I. Plus it's a fantastic to pop popcorn if you use a stovetop method instead of an air popper.